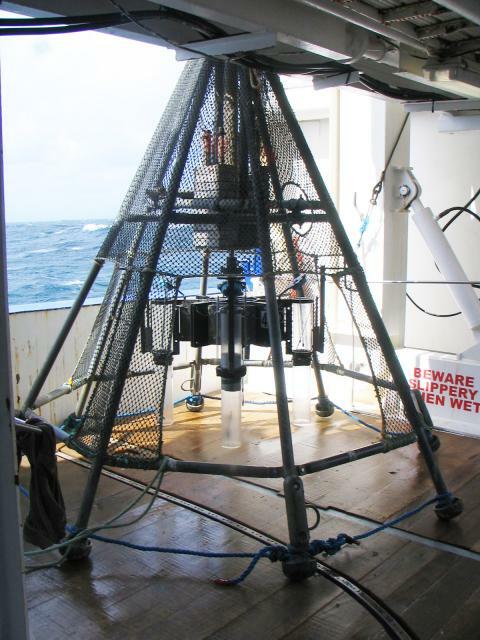 Multicore sampling device used to collect sediment samples during an autumn 2006 cruise onboard NIWA vessel Tangaroa. The multicorer is so called because, at each deployment site, the device collects more than one sediment core. Individual core pipes are seen in the image as plastic tubes. When the feet of the tripod-like frame hit the seabed, the mass block that is visible towards the top of the tripod is triggered and pushes the array of sampling tubes into the seafloor sediment. Image courtesy of Clark Alexander, Skidaway Institute of Oceanography.